The scorching hot weather once again greeted the GT Radial FlatOut Race Series (FORS) as it staged Round 3 of the 2016 season at the Batangas Racing Circuit (BRC) last May 7. This mirrored the day’s on-track action as the battles in the Time Attack challenge and Grid races heated up even more. Utilizing the full 3.7 km course, the day featured a total of 51 drivers competing in 14 individual brackets. 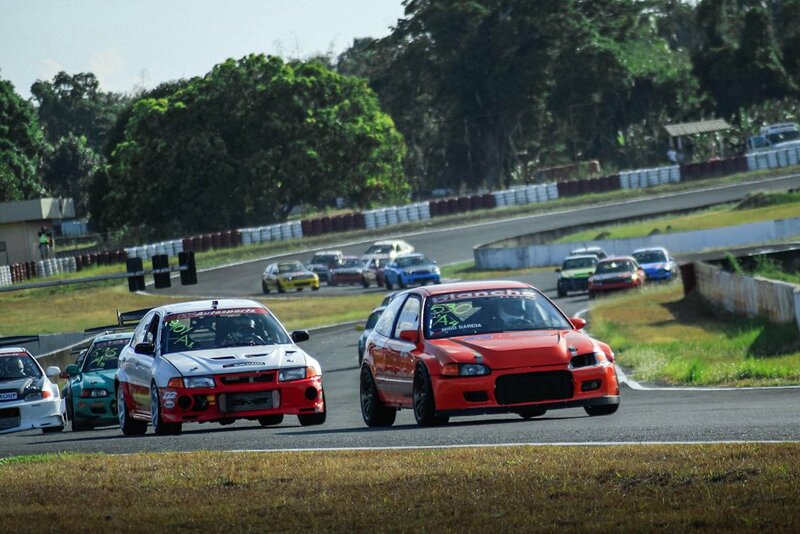 All the action was run under the watchful eye of the Automobile Association Philippines (AAP). Bracket A, where the fastest drivers slug it out, was topped by Eduardo Suiza in his GT Radial SX2-shod Competition Clutch Honda Civic EG. His best time of 1:48.479 earned him 1st in class. 2nd place went to Niño Garcia with a 1:48.513 lap while in 3rd place was Eduardo Pujol. Competition was very close in Bracket B as the Top 3 drivers were only separated by less than a tenth of a second. The eldest of the Sohu brothers, Gabby, got 1st place with his 1:56:240 run in the PAGCOR/Zenium/Gerco-sponsored Honda Civic Hatchback. Sydney Sarmiento in the AEM Performance Electronics Honda Civic Hatchback came in 2nd with a 1:56:255 best, while Dominique Bon took the last step of the podium with a best time of 1:56:301. Gabby’s youngest brother Miggy Sohu in another PAGCOR/Zenium/Gerco-backed Honda Civic Hatchback topped the time sheet in Bracket C with a 1:59:049 lap. Joey Howard managed to finish right behind in 2nd and Paolo Lofamia came in 3rd. Bracket D saw Polo Bautista claim 1st place after posting a best time of 2:02:220. Sherwin Bargos and Niel Bryan Diaz complete the podium in 2nd and 3rd, respectively. Meanwhile, Zacharry Mendoza’s win broke the winning streak of Raymond De Pano who had to settle for 2nd. Miguel Dela Cruz came in 3rd. The most number of entries was found in Bracket F with 9 cars competing for the win. The fastest was Anthony Richard Lanting who finished 1st, followed by Jack Saquilayan in 2nd, and Florentino Gonzales in 3rd. Bracket G’s fastest driver was Robert Tan while Bryan Firme took home 2nd and Mark Macas in 3rd. Lastly, Dominique Bon set the fastest lap of the day in the open class Bracket R with a 1:48.319 time. He was followed by Eduardo Suiza in 2nd and Niño Garcia in 3rd. One name missing from the podium was JC Baguisa of JCT-Blanche. The winner of Round 1 and 2 struggled with mechanical problems, preventing him from setting a proper time. Like in previous rounds, Grids A, B, and C were combined to form a full 18-car grid. JC Baguisa’s bad luck continued in the GT Radial Grid A Race. While fighting for the lead, he locked up his brakes causing a collision with Eduardo Suiza and a DNF. Meanwhile, Niño Garcia managed to overtake Rafael La’O and Eduardo Pujol early in the race and built a 13.144 sec gap to claim 1st place. Trailing behind were La’O in 2nd and Pujol taking 3rd. The battle in the Smart Fuels Grid B race saw Dominique Bon cross the finish line in 1st with Andrew De Asis only 1.234 secs behind in 2nd. It was a close fight between Baguio’s Gabby Sohu, Ed Christian Go, and Sydney Sarmiento with only a few seconds separating the three. But in the end, it was Sohu who managed to finish 3rd. Go and Sarmiento, on the other hand, were handed 4-minute penalties each for breaking out. For Competition Clutch Grid C, Joey Howard lead the 12-lap race and saw the chequered flag with a mere 1.391 sec lead. Aaron Lao was 2nd and Lesley Tuazon was 3rd. The shorter 10-lap Grid D and E races featured a total of 20 drivers. Learning from mistakes in the previous race, Polo Bautista made sure to drive within his bracket to win in the Buddy Club Grid D. Finishing a full 4.326 secs behind was Allan Araro in 2nd and Arvin Drueco in 3rd. The Works Bell Grid E race had the largest number of drivers with 11 entries. Robert Tan bagged 1st place followed by Leo Candava and Marlo Marcos in 2nd and 3rd, respectively. For Round 4, the FlatOut Race Series (FORS) heads to the Clark International Speedway (CIS) on June 4, 2016.